So, if any of you have been following my activities recently you may have noticed that nothing really big has happened for a while. This has been largely a result of job hunting and a lack of motivation, but this is getting ready to change. Next week we will be beginning a drive out to Alice Springs where I will begin a new job and an exciting new life of desert based adventure. The first stage of the adventure will be the drive. 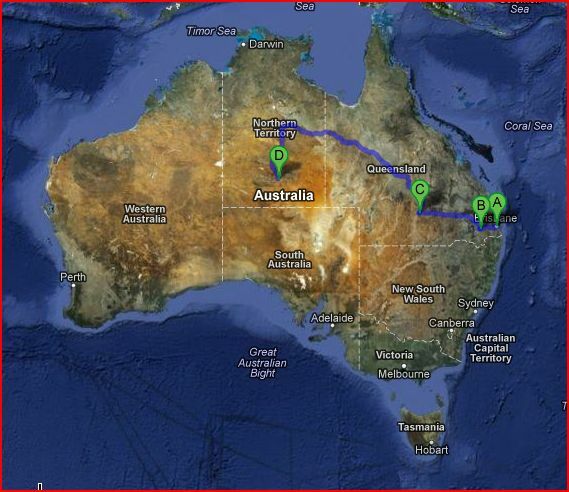 Starting from Brisbane we will head out through Clare’s place, Charleville, Longreach, Winton (with the dinosaur footprints), Mt Isa, Tennant Creek and finally Alice Springs. When in Alice Springs the first thing you should do is check out the MacDonnell Ranges which extend east and west from Alice and are full of water holes, gorges and a whole range of rare and unique ecosystems. Ride in a team at the 6hr MTB enduro happening in Alice Springs on the day I arrive. Hopefully I will be riding in a team and will only have to do one or two laps but we will see, if nothing else I will get to meet a whole lot of cool local riders who can show me the tracks around town. The Mt Gillen MTB Enduro is apparently the biggest event of the year, so it will be a great opportunity. I’m going to start my new job, and will have to work out how I used to get up and go to work.